Small class size – lots of individual instruction. Looking for Mogi’s How to be a Master Hair Stylist DVD w/Pfizz Comb? Click on the link below! Scissor form. How to practice hair scissors. Haircut : Before you do haircut to your clientele you have to know about haircut tool, Quick video to show how quickly you can advance you scissor proper form. Click the link to see how my stylist practice. Mogi demonstrates step by step how to do an inside out haircut!! Sometimes you see so many differences under lines that mean you did cut one length line graduation cut, or you left the section of the hair when you try to cut straight line. 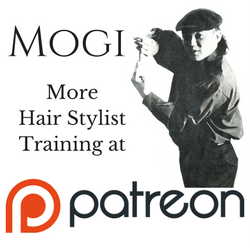 Master Hair Stylist Mogi teaches the Mogi method for mastering your cutting technique. This is part 2 of the series. This lesson goes over how your body position and movements affect the angles of your cut. With hard work and practice of the proper position and hand positions, you will be able to cut hair consistently and quickly while reducing fatigue. If you do truly one length haircut is very beautiful, that you need lots of practice to be done like Priscilla, but if you right to way to practice you can do it good as her! One page of the practice chart is designed for you to practice about 8 hours per page. If you do not practice at least this much, it will be very difficult to utilize body motion. Want a haircut done by Mogi? Please click below! Haircut tutorial Regarding the practice chart. Haircut tutorial,How to haircut Regarding the practice chart. when you do haircut your body motion if very importunate for you haircut coming out.